after bin Zayed retweeted a post accusing Fahreddin Pasha, the famed Ottoman governor who defended Medina against British forces, of having committed crimes against the local population, including stealing their property and the sacred relics of the Prophet Muhammad’s tomb. “These are Erdogan’s ancestors and their history with Arabs and Muslims,” the post said. Erdogan, and his spokesperson Ibrahim Kalin, were quick to slam bin Zayed for his “propaganda lie that seeks to turn Turks and Arabs against one another”. “When my ancestors were defending Medina, you impudent (man), where were yours? Some impertinent man sinks low and goes as far as accusing our ancestors of thievery. What spoiled this man? He was spoiled by oil, by the money he has,” wrote Erdogan. Ankara’s relations with both Abu Dhabi and Riyadh have already been strained. 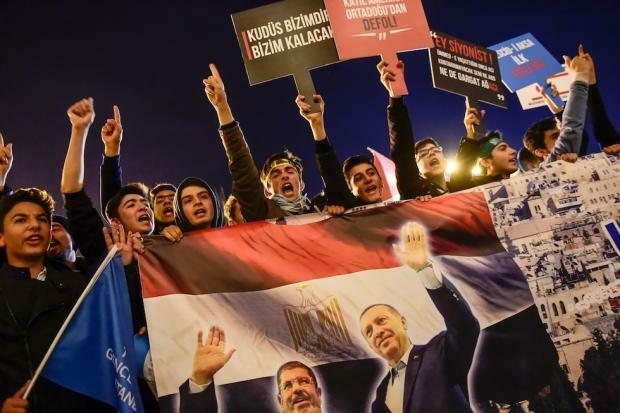 Diplomatic ties have strained after Turkey voiced support for the popular uprisings that rocked the Arab world in 2011, commonly known as the Arab Spring. Ankara openly supported calls for democratic change. It even went so far as to cut its diplomatic ties with Egypt when the country’s first democratically elected president, Mohamed Morsi of the Muslim Brotherhood, was ousted through a military coup while Abu Dhabi supported the coup. Consequently, the UAE recalled its ambassador to Ankara. The post remained vacant for three years until a new ambassador was appointed in 2016. Following Turkey’s July 2016 coup attempt relations were tense again, with Turkish Foreign Minister Mevlut Cavusoglu reportedly accusing the Gulf country of “financing the coup”. Furthermore, Yeni Safak columnist Mehmet Acet wrote that the Turkish foreign minister told him a Middle Eastern country allocated $3bn in support for the coup plotters. Acet said Turkey’s top diplomat pointed at the UAE. In an exclusive MEE story, Turkish intelligence sources were cited as saying that the Emirati government collaborated with the putschists before the unsuccessful attempt was launched, using exiled Fatah leader Mohammed Dahlan as a go-between with Fathullah Gulen, a US-based Turkish fugitive cult leader who mastermind the failed military coup. Dahlan also plays a role in Abu Dhabi’s attempt to sway public perception on Turkey in the Arab world. Egypt-based Al Ghad TV, owned by Dahlan, conducted an interview with Gülen in which he called on the West to eliminate Erdogan, only three weeks after the attempted coup. I have also recently learned that the UAE-linked Al Arab Publishing House, which owns the Arab Weekly, is the financier of a newly launched London-based news portal run by three fugitive Turkish journalists, including one who wrote that he was involved in “many levels” of the Gulenist cult in the 90s. Leaked e-mails of the Emirati ambassador to the US disclosed the UAE’s close cooperation with the Foundation for Defence of Democracies (FDD), funded by the American billionaire Sheldon Adelson. It is one of the most prominent supporters of Israel and known for its neocon political leaning and anti-Turkish sentiments. But it was reportedly President Erdogan’s firm stand and leadership on the US decision on Jerusalem that has provoked the Saudi-Emirati axis to target Turkey in a vile media campaign. When US media reported that the Trump administration was preparing to announce the US recognition of Jerusalem as the Israeli capital, Erdogan, in a statement directed at the US president, said: “Jerusalem is a red line for Muslims”, and that such a move would be in violation of international law. The response came immediately from Israeli minister of intelligence and transport Yisrael Katz who said: “We don’t take orders or accept threats from the president of Turkey.” That same Israeli minister was recently interviewed by a Saudi newspaper in which he invited Crown Prince Mohammed Bin Salman (MbS) to Israel. It has been widely reported by many media outlets that both MbS and Jared Kushner, Trump’s son-in-law and adviser, drafted Washington’s Jerusalem plan. While secretly putting pressure on Palestinian President Mahmoud Abbas to accept the plan, the Saudi-led axis, which includes UAE, Egypt and Bahrain, publicly voiced concern and opposition to Trump’s move for domestic consumption. The Saudi-led axis avoided joining the emergency Jerusalem summit of the Organisaton of Islamic Cooperation that was called upon by Erdogan earlier this month. However, when the open voting session started at the United Nations General Assembly, they had no other option but to vote in favour of the resolution. And while the world was focusing on how to further counter Trump’s move, the Saudi-UAE axis was finding it difficult to counter various reports showing how, for them, Jerusalem was a “side issue”, as described by the Bahraini foreign minister, whose country sent a peace delegation to Israel days after Washington’s Jerusalem move. “It’s not helpful to pick a fight with the US over side issues while we together fight the clear and present danger of the theo-fascist Islamic republic,” the Bahraini foreign minister tweeted days after the move. Another prominent Saudi religious scholar from King Saud University – with 20.4 million followers on Twitter – ignored the debate over the US Jerusalem move and instead tweeted 16 posts on importance of wearing “clean socks”. Surely this did not miss the attention of Palestinians. In response, protesters in Gaza burned the posters of the Saudi king and the crown prince, while other protesters in Jerusalem held posters of Erdogan for speaking out on the matter. Even the head of general security for Dubai, Dhahi Khalfan Tamim, who previously stated that Palestinians should abandon their aspiration for an independent state, tweeted in defence of the Palestinians’ right to form a state with its capital Jerusalem. Saudi-UAE supporters may think they are countering Turkey by posting photographs of Erdogan with former Israeli prime minister Ariel Sharon and other Israeli officials, but they are not. “Diplomacy”, “reciprocity”, “red-line” and “conjuncture” are well-perceived phrases by the people of Middle East. During a visit to Gaza last year when a reconciliation agreement was signed between Ankara and Tel Aviv, I conducted interviews with people on the streets and some NGOs. When I asked them about the then normalisation of Turkey-Israel ties, which partially removed the blockade, Palestinians in Gaza generally said it is difficult to trust Israel’s promises and expressed gratitude for support they received during the Israeli aggression in 2008, 2012 and 2014. “We have no doubts about Turkey’s sincerity. Some Arab countries that do not have diplomatic ties with Israel but they also don’t even want to hear the word Palestine or Gaza,” one Gaza resident told me. According to a recently released study by the Pew Research Centre, unsurprisingly Turkey is viewed as having gained prominence in the Middle East and people in the region tend to see Erdogan more positively than the other Middle Eastern leaders. Following the Jerusalem crisis and the Fahreddin Pasha feud, I wonder what would the results of a larger Middle East survey tell us about Saudi-UAE circle and Turkey, their current top enemy after Iran and Qatar.